Nature Shop UK was gracious enough to participate in the Spring in to Adventure Giveaway with a couple of pairs of Merrell Shoes. The Merrell Siren Breeze was review by Tiffany at ALittleCampy.com and I received a pair from Merrell’s new barefoot training series, the Sonic Glove. I had been considering barefoot training and had read many articles and research about the benefits of barefoot running for foot health and muscle strength. There is a huge trend in running circles toward a more natural zero-drop, barefoot style of running that focuses on natural bio-mechanics. Merrell has jumped into this trend with both feet (pun intended) and launched a whole campaign and product line around barefoot running here. This new section of their website encourages you to “Go Barefoot” and “Run Naturally” with their new line of minimalist shoes and offers a huge resource of good information for those who want to start. I studied up on the mechanics of barefoot running and took my Sonic Gloves out for a spin. My very first run in the Sonic Glove was uncomfortable. I guess I expected it to be. Most of the articles I read stated something to the effect of “it will take some getting used to…” which usually means, “it will hurt!” My first run was slow, very focused on mechanics and a little painful. 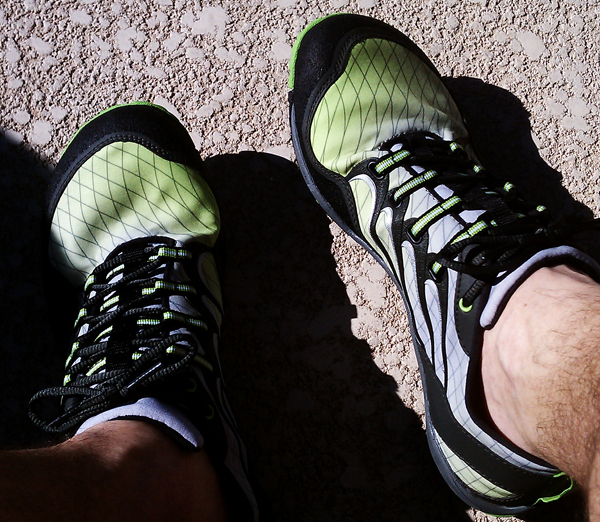 The shoes worked as they should, it certainly had the feel of running barefoot. The Vibram outsole was actually pretty nice and the tread gave me enough protection while still letting me feel connected to the ground. I wore the shoes without socks. The Sonic Glove (and all of Merrell’s barefoot shoes) have a permanently bonded anti-microbial shield embedded in the upper material and the footbed to protect against odor, staining and deterioration caused by bacteria and fungus. My skin did not handle the direct contact with the shoe well and my feet were rubbed raw after only a short 1-mile run. The next time I tried them I went barefoot again, but taped up the parts of my foot that had been rubbed raw on the previous run. I wanted to wear the shoes as intended and, by all indications, that meant no socks. I put 3.5- miles on the shoes on my second run. It took a couple of miles of awkward, uncoordinated running for me to find my barefoot stride. Unfortunately it also took a couple of miles for the shoes to wear through the tape. So just as I was starting to feel comfortable with the movement of barefoot running, I was starting to feel the rub. I pushed through and finished the 3.5-miles and, bleeding aside, felt good about the run. For the next few days I was sore in places that running had never made me sore before. I took this as a good sign that barefoot running was working muscles and joints in a way (hopefully a good way) they hadn’t been worked before. I avoided running in these shoes for a little while afterward because I wanted my skin to heal before trying them again. The next couple of runs in them I decided to wear my thin Injinji toesocks to provide a little protection. This helped. What I liked about these shoes is that they are lightweight and do, near as I can tell, offer a very close-to-barefoot running experience. Even the shape of the Vibram outsole mimics the natural shape of a human foot. I also like that the anti-microbial coating and feel like with regular, long-term usage these shoes would be a nightmare without it. My footing felt secure, but there was not so much protection that it was comfortable to run on the extremely rocky Arizona trails I usually run. I do feel like if I had the softer trails of the Pacific Northwest to run on I would enjoy these as trail runners much more. My biggest disappointment was that I really wished the upper was more comfortable. With a softer, more comfortable upper it would have been a much better and more realistic “barefoot” experience. But the upper was stiff and rubbed my feet in a way that constantly reminded me I had a shoe on. Perhaps, with time, I could break-in the upper a bit more and build callouses in the right spots to make this a non-issue. 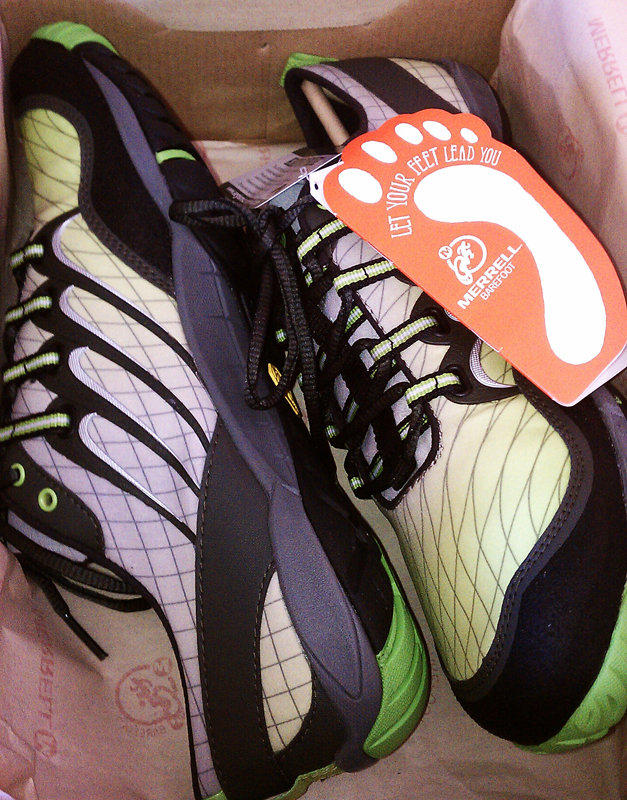 I do like the support system that Merrell offers for the barefoot running community. The literature that comes in the box has tips and instructions on what to expect with minimalist, barefoot running and how to get started. Their website also has a great deal of information for the beginner and seasoned barefoot runner. I find this encouraging to keep it up and work barefoot running into my regular training. All in all, it’s a decent shoe and at $125 retail, it’s a little on the high side but still competitively priced. I would definitely recommend getting fitted properly and trying on several different pairs, brands and styles before making a decision. Having a resource like the Nature Shop can be your best path to finding the right barefoot trainer for your feet. Nature Shop has this pair currently on sale for $87.50 (30% OFF) here.